Do your students need more practice or to learn all Exponent Laws? 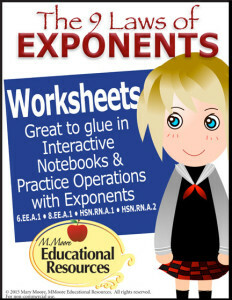 These worksheets are perfect to teach, review, or reinforce Exponent skills! These worksheets cover all 9 laws of Exponents and may be used to glue in interactive notebooks, used as classwork, homework, quizzes, etc. Tips, Instructions, & More are included. Perfect for teaching & reviewing the laws and operations of Exponents. For 5th Grade & Middle School some of the sheets may be used for GATE. Covers CCSS Standards: 5.NBT.A.2 • 6.EE.A.1 • 8.EE.A.1 • HSN.RN.A.1 • HSN.RN.A.2. Perfect for Interactive Notebooks! Learn more about these worksheets and other great teaching resources here…..